Are you looking for promotional items, which are used everyday and more than once? Then the premium cups and mugs by allbranded are the right thing for you! With their modern look they are quick to catch the eye and can be an effective representative for your promotional messages. Various varieties of colours for coffee mugs, cappuccino, espresso and tea cups as well as thermo mugs will lead to the maximum success of your marketing campaign. With our special personalisation techniques, we will print your cups and mugs according to your requirements and create your own personal promotional gift. If you think about promotional products, the cups or mugs are one of the first things to pop up. For many years, this everyday item was and still is one of the most popular promotional items in Britain. Whether as a promotional gift for Christmas or as a giveaway at a new opening, the personalised mugs are very popular among your target audience. 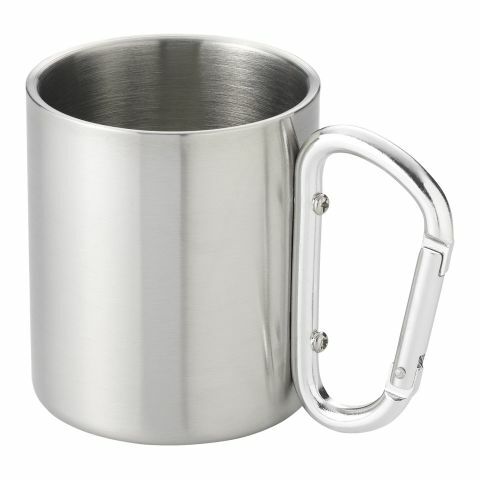 The drinkware with handles are perfect for hot drinks. As the opposite of these promotional items, we also offer mugs with your corporate specific design, which can be used as drinkware during the summer. Be it for the hot coffee or a cold beer, cups and mugs are essential items in our day-to-day life. 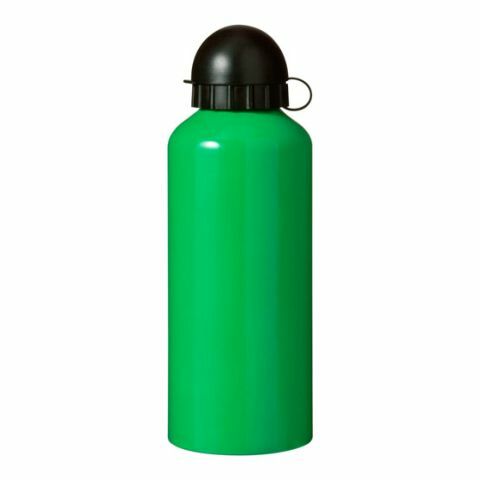 Use this permanent product high, for your company’s benefit and create your own individual promotional items from the promotional drinksware category. By doing this, you will address a variety of target groups and will make your company present at comfortable winter evenings, or at lively festivals. Even as a gift for a co-worker, branded drinkware is one of the best choices. Used for the morning coffee, these branded mugs will even get the least active morning person going. We have to consume drinks. They have the purpose of keeping us alive. No wonder, that branded mugs and branded cups are one of the most sold promotional items for over a decade. Their popularity stems from their high user value. Because they belong to the category of reusable promotional items, being one of the most used item throughout the day, branded drinkware is one of the most ideal promotional items, to strengthen brand awareness with your target group. According to the UK Tea & Infusions Association, Britons drink around 165 million cups of tea daily, which is around 3 cups a day. You can use this habit to your advantage, by branding your cups and mugs and as a result, make your brand present throughout your target groups’ day. Most of the people have a favourite mug when it comes to drinking their hot beverages, which stands out through its shape, colour and material from other mugs (or because it was a present form you!) Equip your company with a promotional product, which will, through its high user value, pass on a long-lasting marketing message to your customers, co-workers and business partners. With the personalisable branded mugs and branded cups, you will not only order a promotional item, which you can give out to your target group, but also an item, which can be used and even re-used at your own company events. All the promotional items of this category are reusable and score positive points with this characteristic. With this branded drinkware you can enrich external and internal events with your corporate design. In the allbranded online shop, you can find a large amount of cups with a content capacity of 125 ml, as well as mugs with a content capacity of 250 ml. 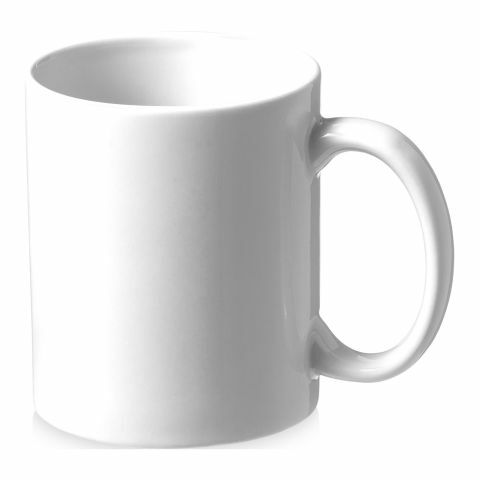 In general, mugs with a content capacity of more than 200 ml are called coffee mugs, smaller containers can be found under the category coffee cups. The materials, which can be used, are, for example, glass, ceramics and porcelain, with or without a handle. Ordering saucers with your mugs and cups, is also strongly recommended. Depending on the choice of cup, you can choose between various colours and printing methods, to perfectly display your marketing message. In general mugs and cups are being printed on using the pad printing method. Next to the classic mugs and cups, which are mostly being chosen as the usual promotional items, you can also find extraordinary promotional ideas in our online shop. Special highlights are for example, the Rastal glass cups in the frozen look. The milky glass can be branded, using the laser engraving method. The most popular items at the moment are thermo mugs. Versions made out of metal, ceramics and plastic can be personalised according to your requirements and can display your brand in public. 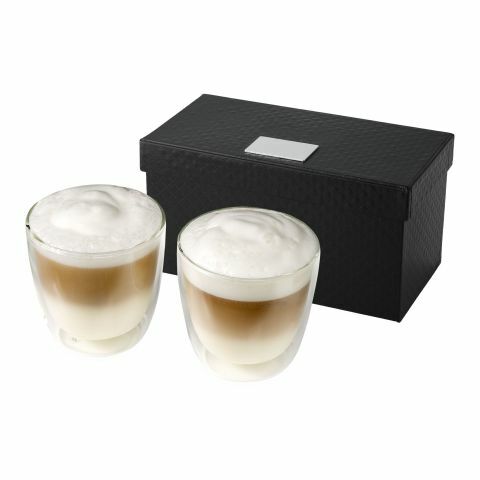 For festive occasions, like anniversaries or seasonal events such as Easter or Christmas, you can give cup sets, consisting of espresso cups, as gifts. Even our premium carafes (also available in a set with wine glasses!) are beautiful promotional gifts. You can also find special sets from star chef Jamie Oliver, which are made out of recycled jam glasses and can be personalised according to your corporate identity. When drinking hot beverages, there are feelings involved, which stand for community and interaction. If your promotional mug is the most popular one in the office, you will certainly receive positive associations with your brand. Even the repeated use of premium glass cups by popular employees shows identification with your brand’s values. Gossip in the break, is as associated with the coffee mug, as are lighters with smoking. You can use this trait to present your company as being modern and contemporary. Having your mug associated with a lifestyle and luxury product like name brand coffee, you can be sure that your promotional drinkware will be regularly used. You can also find drinking bottles in our online shop. If you are a bike salesman, then you should think about giving your customers a branded drinking bottle for every annual bike inspection they do at your shop. By doing this, your logo will be a real eye-catcher at the next bike tour. Order your personalised promotional cups easy and comfortably online or give our friendly team a call for a quick consultation.